The right nail file can make a perfect manicure, however, get it wrong and it really goes wrong. Files help you define the shape of your nails, refine any course areas, and smooth rough edges, providing a good base for your manicure. 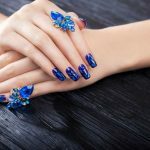 But a simple search for nail files can throw you into confusion with the amount of types, and their respective qualities. These are the most common type of nail file, and consist of two grades of grit on either side of a strong cardboard file. Similar to Emery boards, but using wood, instead of cardboard. Often used for pedicures. These longer lasting files can be sterilized and minimise chipping and breaking due to their gentleness. These are bulky square blocks made with files of a different grades of grit on each side of the block, serving a different purpose. These files are made of stainless steel and may not be suitable for your natural nails as they can cause breaking and chipping. Making filing easy although they can take time to master. So, which nail files and buffers made my Top 3? The fan of ten files contains a mix of different grades is sanitizable, and beautifully gentle on your nails, either natural or artificial. Being so sturdy, you only need to apply a light pressure to leave your nails looking perfect. The ‘honey’ scent that was advertised, smells more glue like, but my nails look good, so I don’t care. This is a handy multi pack with plenty of different grades of file. They are washable, very durable and a great price. ★★Excellent Nail Filing Tools- These black nail files work quickly to trim or shape the acrylic nail with your desired shape or length. They are also perfect to remove nail gel in your extended or fake nails.Also suitable for Pet Grooming! Is it wrong that I think this set of 3 nail files is gorgeous? The graduated blue shades makes these look so stylish when you pull them out of your bag for an absent-minded file. Extremely durable, but oh so gentle, and with a lifetime guarantee – I love these. I want these to be available in a range of colors to match every outfit. Surprisingly inexpensive for such a fabulous set of nail files. With 6 different grades of nail files and multicolored buffing blocks, this is an awesome set of nail tools. Great for natural nails all the way through to press-ons, and can even be used on pets (though I haven’t tried that), this professional quality kit is robust and does the job easily. The nail files could be a little longer, but they work just fine. A budget friendly set of excellent nail tools. You can’t go wrong! 【Diy yourself freely as like at salon】 - Professional nail file and buffer set,they have rough grit that can sand down the large ridges in your nails,it also helps get the glue off,will be save money from nail's shop. Also can used for your pet.